The use of mounted forklift trucks has expanded enormously in the transport sector over the last couple of years. 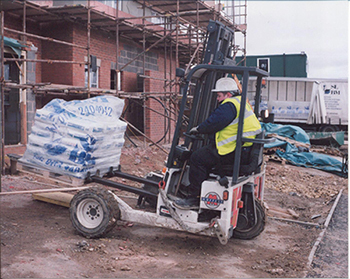 By using the mountable fork lift truck it is possible to load and unload goods there where it is needed. This means an extra service but also operational costs are kept down for the customer and also for the transporter. Just like other loading and unloading equipment, there is an enormous variety of mounted forklift trucks available. Options like capacity, wheel drive, mast height and other options offer the best possible solutions for customers. One can choose out of different attachments which can be mounted on the fork carrier. Think of a side-shift or a fork adjuster for positioning a load or positioning forks because of different pallet dimensions. Another frequently used attachment are the telescopic forks. These hydraulic telescopic lift truck forks have been produced by world market leader Meijer Handling Solutions for more than 20 years. The telescopic forks can be mounted on every lift truck in any desirable capacity. By using telescopic forks loads can be loaded and unloaded from one side. Also goods with different pallet dimensions can be handled because the best suitable fork length is always used. It also solves the problem of having forks that are too long. Telescopic forks do not damage other pallets because the forks do not stick out. Little attention is paid to this, but damage to goods is an enormous expense within the logistic sector. At the moment 30% of all mounted forklift trucks all over the world is equipped with telescopic forks. The use of Meijer’s telescopic forks are recommended in this line of business. A percentage which also proves that the telescopic forks are a terrific attachment for the different sectors in which mountable lift trucks are being used. Telescopic forks are used for handling food, waste, beverage, bottled gas, lumber, brick and block and building material. Most of these applications can use the standard version of the telescopic forks, but for some applications a special solution is needed. We will inform you about some of these solutions. It often happens that building materials have to be unloaded in building sites where roads are bad or not even there. Nevertheless good have to be delivered correctly. A flat underground is needed to retract forks from pallets. Without the Single Height Shift System (SHSS) goods will slide off the pallet and this will cause damage and loss of time because goods have to be piled up again. The SHSS is designed to adjust the height of one fork to compensate for the horizontal position of the load. It can be used for standard lift truck forks and for telescopic forks as well. Goods that are piled up on laths can use the Thin Range, also developed by Meijer Handling Solutions. The Thin Range has a thickness of 47 mm and still a capacity of 3200 kg on an LC of 600 mm. As mentioned before a mounted forklift truck can deliver goods everywhere, but this can also be a problem when goods have to be delivered in a space. When the under-door clearance in combination with the required lift height is an impediment, it is not possible to drive the truck inside. Most of the time this problem is solved by using a triple mast, but this is also limited. 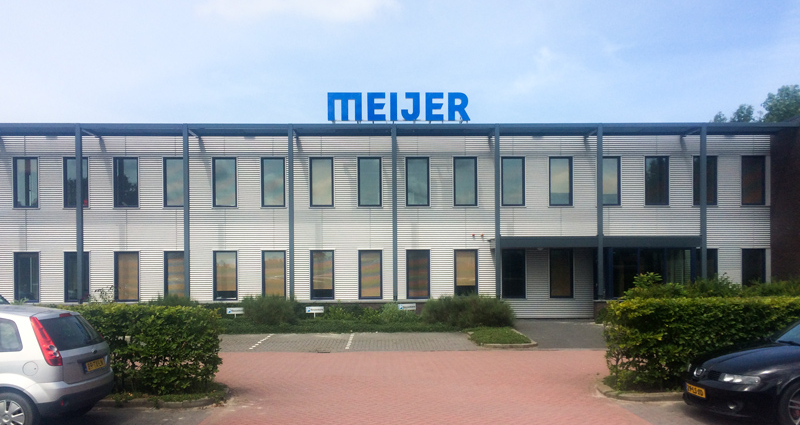 Because of this Meijer Special Equipment has developed the Double Height Shift System (DHSS). Because of an integrated synchronisation system the DHSS guarantees 100% equal movement . This system can be easily mounted onto the fork carrier of the mountable fork lift truck and it offers an extra lift height varying from 300 mm to over 1000 mm. This system will hardly influence the lost load centre of the mountable lift truck and therefore it is an alternative for a triple mast. Of course it is also possible to equip telescopic lift truck forks with the unique DHSS system. A special range of mounted forklift trucks is the four-way version developed for handling long goods that can be transported laterally. This to save space widthwise. These machines are mainly used for building materials and therefore they have got a high capacity. Manoeuvring these heavy machines is made easier because of the special features producers think of, but this does not solve the problem of swinging. A slight movement can cause a lot of deflection which causes a lot of damage. Meijer Handling Solutions supplies the telescopic lift truck forks with an integrated air valve which makes it possible to operate every fork independently. Now the mountable lift truck is able to manoeuvre easily while the load stays in place. Brick & Blocks are also building materials, but they are not stapled on pallets. They are bundled and lifted with a special stone grab. On the other hand some packages can be lifted and stacked with special small forks. These small telescopic forks can easily be slided in a package and the forks can be mounted in front of the wheel legs of the mounted forklift truck. KOOI-REACHFORKS® meet the new ISO 13284 for telescopic forks.